NEW YORK (CNN) — New York Governor David Paterson said Sunday that Caroline Kennedy "had gotten no signal from me that she had to withdraw" before Kennedy ended her effort last week to fill Hillary Clinton's vacant U.S. Senate. Appearing at a news conference with the person he picked to fill that seat — Democratic Rep. Kirsten Gillibrand of Hudson in upstate New York — Paterson briefly answered reporters' questions about the Kennedy withdrawal, saying the decision was entirely hers. "Caroline Kennedy called me on Wednesday to inform me that for personal reasons she had to withdraw," Paterson said. serving. She took her name out of consideration." When he announced Gillibrand's selection Friday, Paterson declared, "I believe that I have found the best candidate to be the next United States senator from New York." In her turn at the microphone Sunday, Gillibrand made no reference to Kennedy, trying instead to fend off criticism of her selection as a little-known congresswoman from a mostly rural district in upstate New York. Much of that criticism has come from her consistent support of gun-owner rights. "I grew up in a family of hunters," Gillibrand said. "I very much believe in protecting hunters' rights — it is a core value for our region and our state." But she said as a senator she would listen to various groups. "There's a lot of concerns in many of our city communities about gun violence, about keeping our children safe, about making sure guns stay out of the hands of criminals," she said. "Those are all concerns I share, and I will fight very hard to protect our communities." Neither Clinton nor Schumer attended the press conference. Paterson and Gillibrand took the opportunity to praise Clinton, with Paterson saying Gillibrand had to "fill the shoes of a great leader who has gone on to be secretary of state." Gillibrand added, "We could not have a better person as secretary of state right now." Paterson's pick of Gillibrand concluded an apparently chaotic selection process that drew criticism from across the political spectrum. 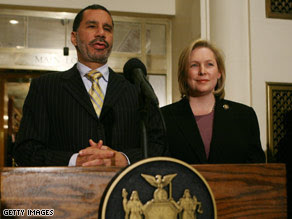 Political observers are speculating that Paterson may have chosen Gillibrand in part because Democrats will have to defend the Senate seat in 2010 special election. Gillibrand — a 42-year-old Albany-born Catholic congresswoman and mother of two — has a proven ability to win over conservative voters in upstate New York, a region traditionally hostile to Democratic candidates.